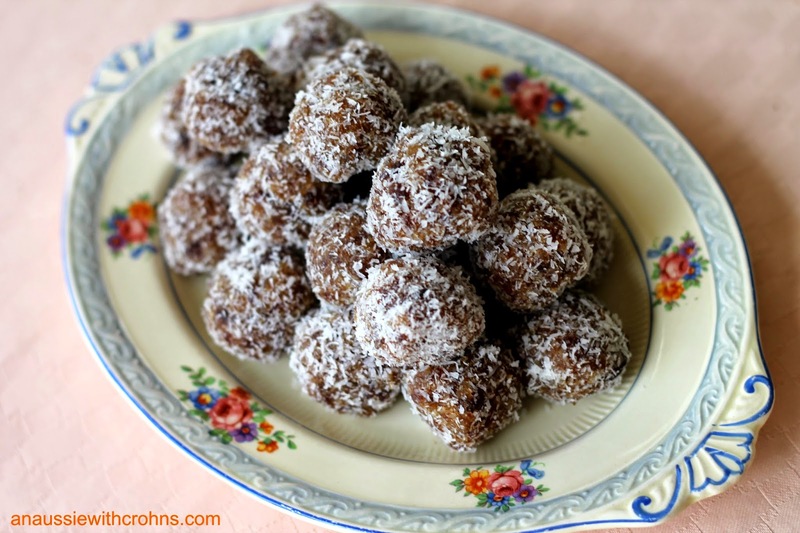 I posted the recipe for a Coconut version on my facebook page, which prompted several people to ask for a nut-free version. So here it is! Made with dried dates and apricots, I think it's my new favourite. I've included a picture of the coconut and apricots that I buy. They both have no added sulfur or preservatives. 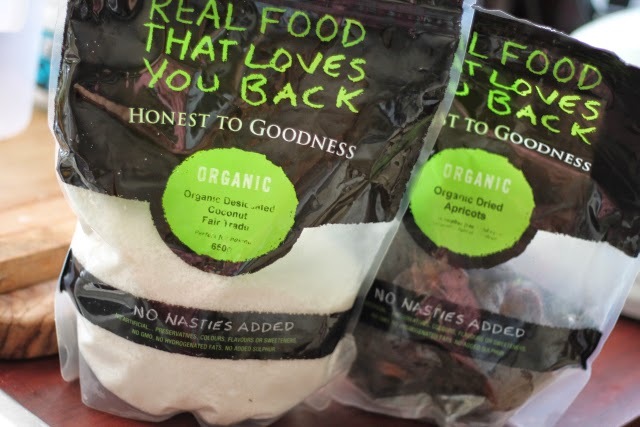 I buy them online from www.mypaleo.com.au. 1 cup desiccated coconut (extra) for rolling. Put dried fruit in a microwave proof bowl, cover with hot water and microwave for 2 minutes. Drain well. 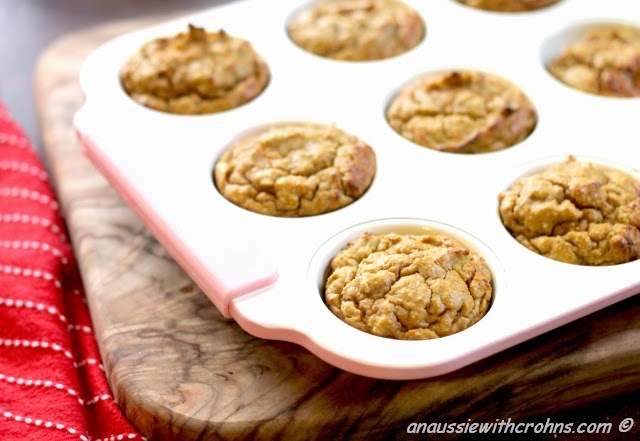 Warm coconut butter and coconut oil in the microwave to melt. Put all ingredients in food processor and blitz until well combined. 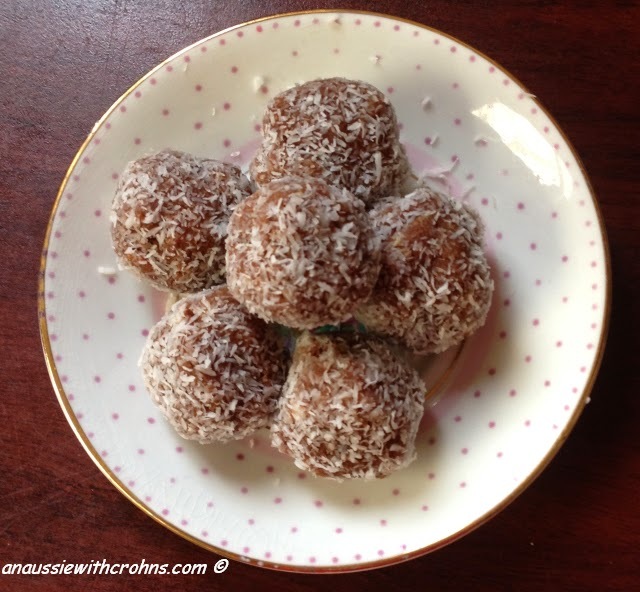 Roll teaspoons of mixture into balls, then roll in desiccated coconut. 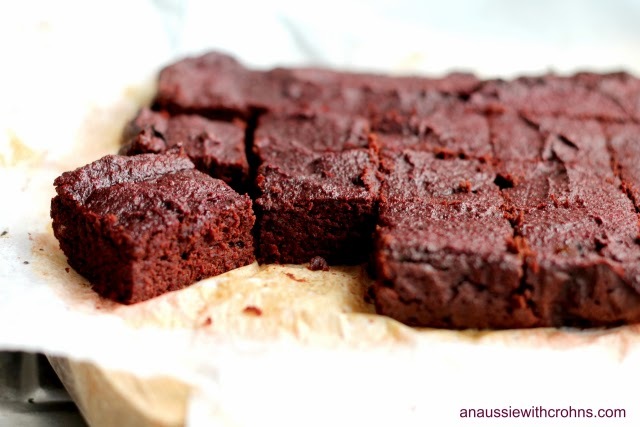 Eat straight away, or put in fridge or freezer to harden slightly. I usually make beetroot dip out of them in the food processor with some tahini, spices and lemon juice. 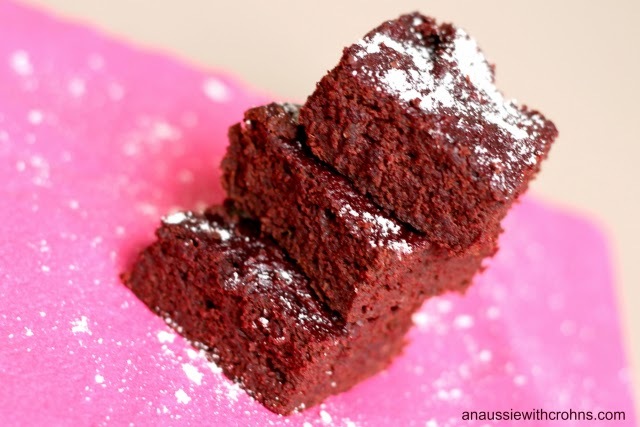 My kids have loved trying the few different versions I've made this week. These are our favourites. 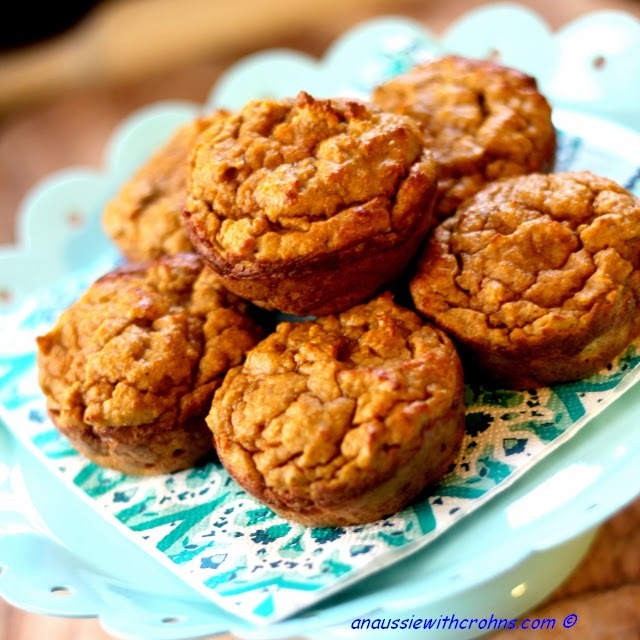 They are sweet enough for me, but add a bit of extra honey if you feel it needs it. Preheat oven to 170 degrees celsius (340F). Line 20 cm (8 inch) square baking pan with baking paper. 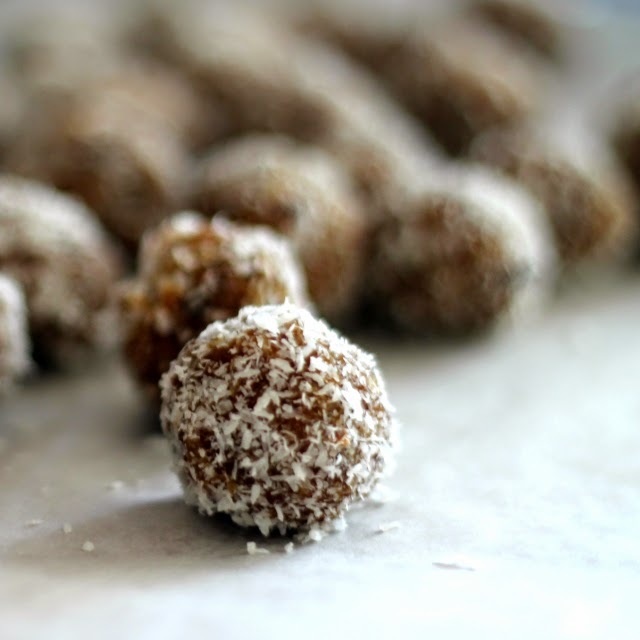 Put dried dates into small bowl, cover with water and microwave for 2 minutes. Drain. Peel roasted beetroot, chop roughly and process in food processor with 3 eggs and drained dates. Add the rest of the ingredients and process again until well blended. Pour mixture into lined baking pan. Bake for 30 minutes until just done. 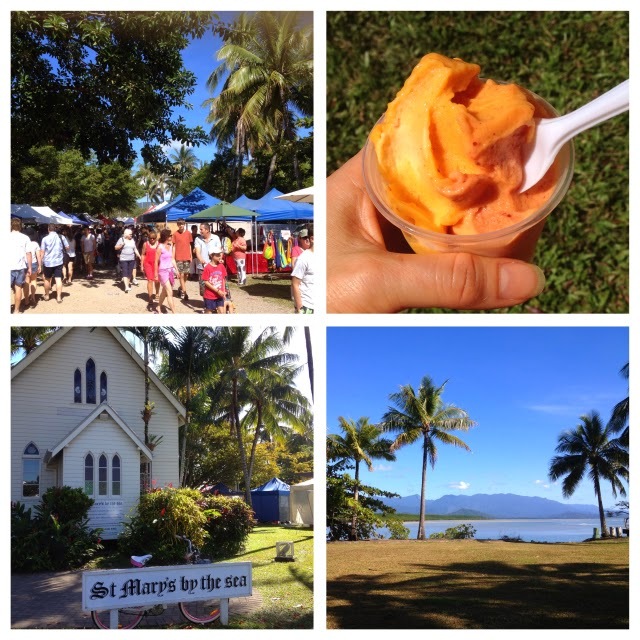 I've had a wonderful week away at Port Douglas during the school holidays. I loved the beautiful blue skies, sunshine and gorgeous beaches. Snorkeling on the Great Barrier Reef and exploring the Daintree Rainforest were highlights. 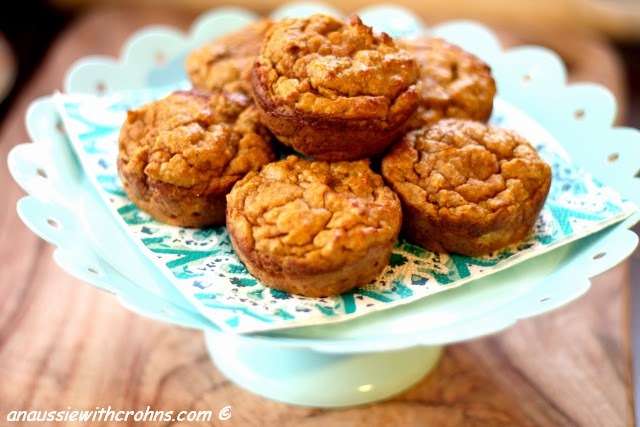 Add the coconut milk, mashed pumpkin and honey (if using) and beat again. 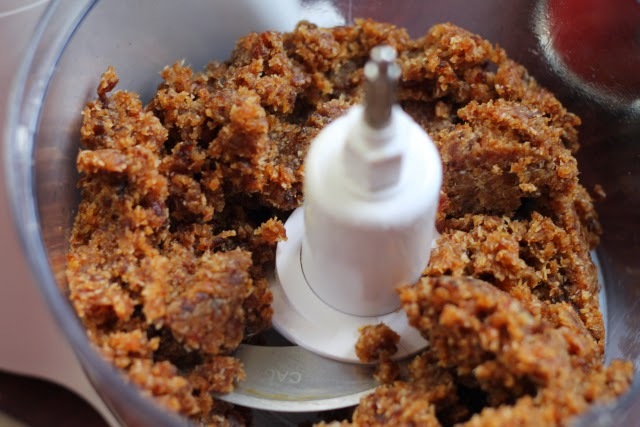 Add the coconut flour, bicarb soda and spices and mix with the electric beaters for another minute. Bake at 170C for 20-25 minutes. Cool in tins. I’ve been making sauerkraut for a few months now and I LOVE it! Even my KIDS love it! Yay! I’ve been reading about how to heal a leaky gut, and found that adding good bacteria is one of the ways to go. The Specific Carbohydrate Diet that I follow includes 24 hour yogurt as a major part of its healing protocol, but I am intolerant to dairy. So instead of the yogurt, I just take daily probiotic capsules. This has worked well for me, but after 2 years on SCD, I started to wonder if I could improve further. 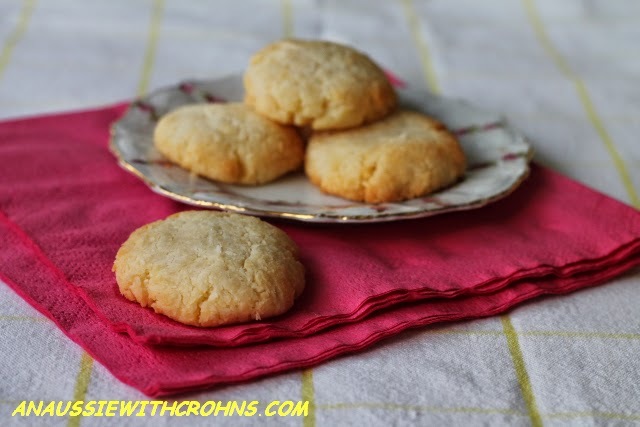 SCD is enough to keep me in remission, but how about actually HEALING my gut? So I’ve been experimenting with fermenting. My kids have been fairly tolerant (there have been a couple, ‘What is that smell, mum?’ questions, but they humour me). Firstly I tried buying sauerkraut from the supermarket, but then read that because it is pasteurized, it doesn’t contain the beneficial lactic acid bacteria. To get the good stuff, you have to make your own. Having healthy gut bacteria is so important. I think everyone should add sauerkraut to their diet to help their immune system. It is also very high in vitamin C with good amounts of vitamin B6 and iron. Awesome. Thankfully, sauerkraut is really easy to make. And fun! Wash the cabbage, peeling off the tough outer leaves. 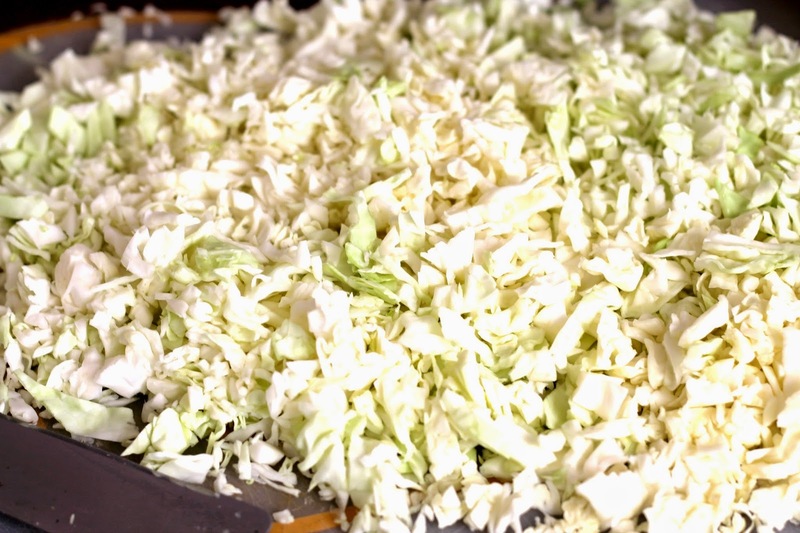 Use your knife (or a food processor) to quarter your cabbage and cut out the core. Finely slice or shred your cabbage. 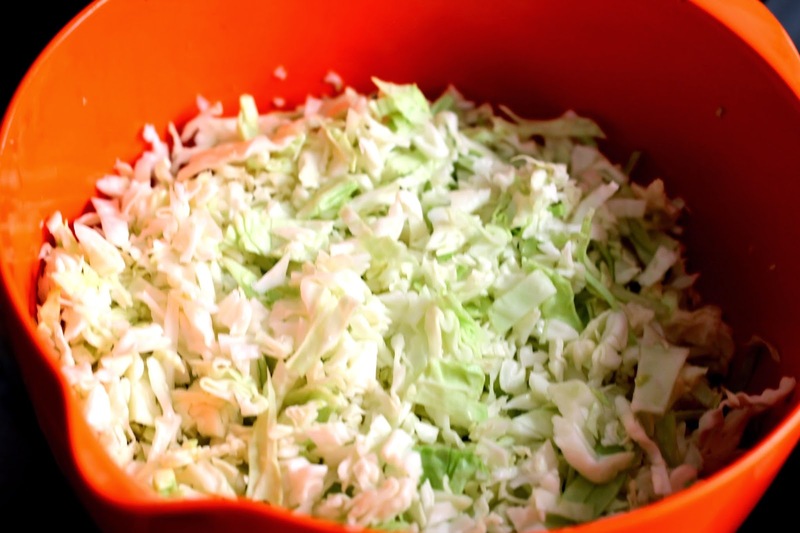 As you chop it, put the shredded cabbage into a large bowl. Grind some sea salt onto each layer of cabbage as you add it to the bowl. 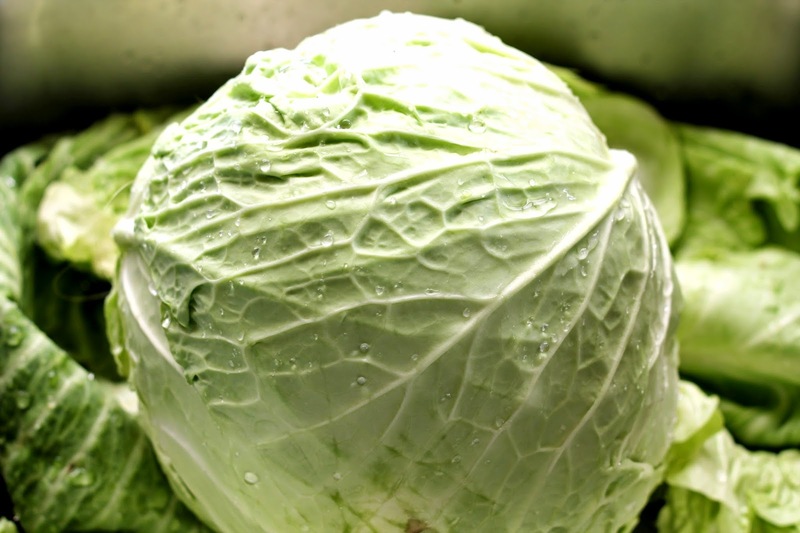 (In total, you need around 2 tablespoons of salt for a medium cabbage). Massaging the cabbage, along with the addition of the salt, draws out the moisture. Time will also do this. You can fill your bowl with the layers of cabbage and salt, leave it to rest for 30 minutes or so and it’s easier to release the juices. Then spoon the cabbage and the released brine into your jar or crock. Keep chopping up your cabbage and layering up your bowl with cabbage and salt. Massage and/or leave each bowlful before adding it to your jar or crock. Important note: Do not fill your jar up to the top! I always find I actually need two jars, so have extras ready just in case. 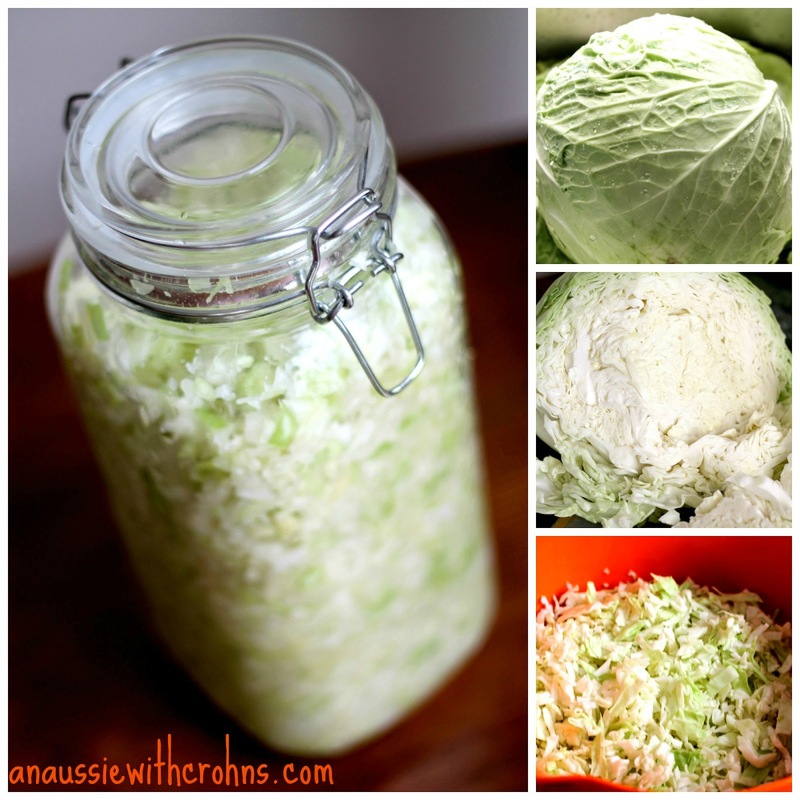 Keep adding your cabbage and salt to the jars. Use the end of a rolling pin to squash down the cabbage in the jar. This releases more juices. If you have a tablespoon of sauerkraut juice from a previous batch, add it at this stage; it will help kick-start the fermentation. 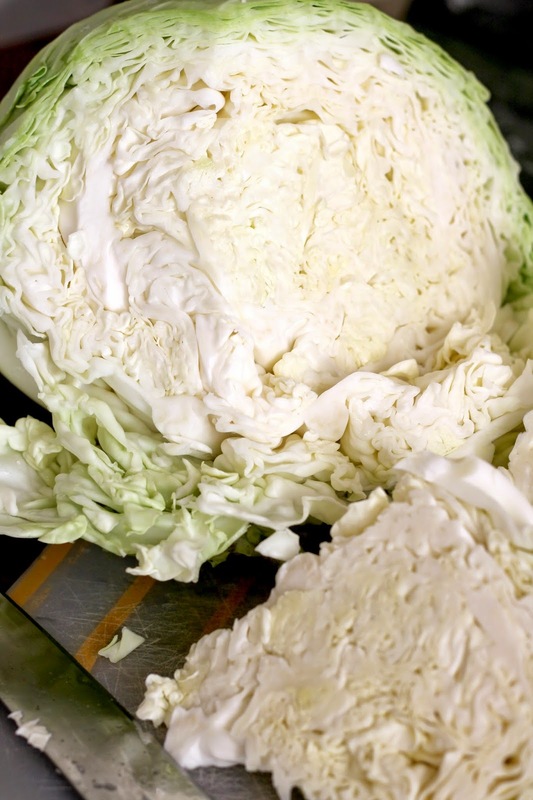 To ferment, the cabbage must be BELOW the surface of the brine. The fermentation is anaerobic; without air. In my jars, I use an old glass jar that I’ve put some water in to weigh it down. Then cover the whole thing with a tea towel to keep out any bugs, dust, etc. You must leave a space (bigger than you think you’ll need) at the top of your jars, because the fermenting process causes much bubbling and overflow. I put my jars out of the sun in a corner of my kitchen bench, but I must admit that each time I don’t leave enough space at the top of my jars and I have cabbage brine covering my bench top! Still learning on this one. After a few days, you can close the lids of your jars. I take out the weighted down with water jars, close the lids and store them in my pantry until they are ready. Leave your jars to ferment for at least one week. In warmer temperatures they will ferment quicker than during winter. I like my sauerkraut after it’s reached the 4 week mark, but my last batch I only left for 2 weeks as we had run out and couldn’t wait any longer. So 2 to 4 weeks to ferment is my suggestion. You can taste test your sauerkraut after one week and see how you like it. Just make sure all the cabbage is under the brine if you decide to leave it for a bit longer. Once it’s the taste you like, store your jar in the fridge. I’ve left my second jar to continue fermenting until we finish eating the first one. Apparently white mold can grow on the top of your sauerkraut as it is fermenting. I haven’t had this happen, but the advice seems to be just to skim it off, that the sauerkraut beneath the brine is fine. I like it on my salads or as a condiment to meat. The sour, tangy taste really adds something special. 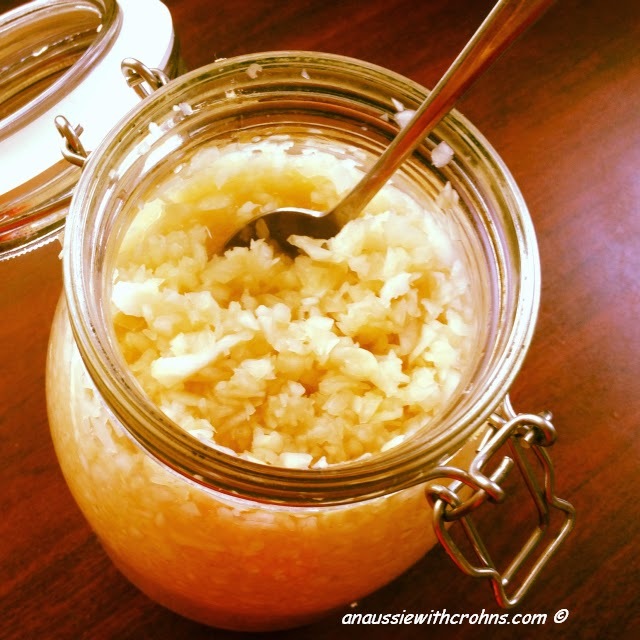 How do you get your kids to eat sauerkraut? Followed by lots of over-the-top praise: ‘Awesome! Well done, sweetie, I’m so proud of you!’ LOL. They all decided they like it and are eating it most days. Yay! Isn’t cabbage hard to digest? Yes, it can be. 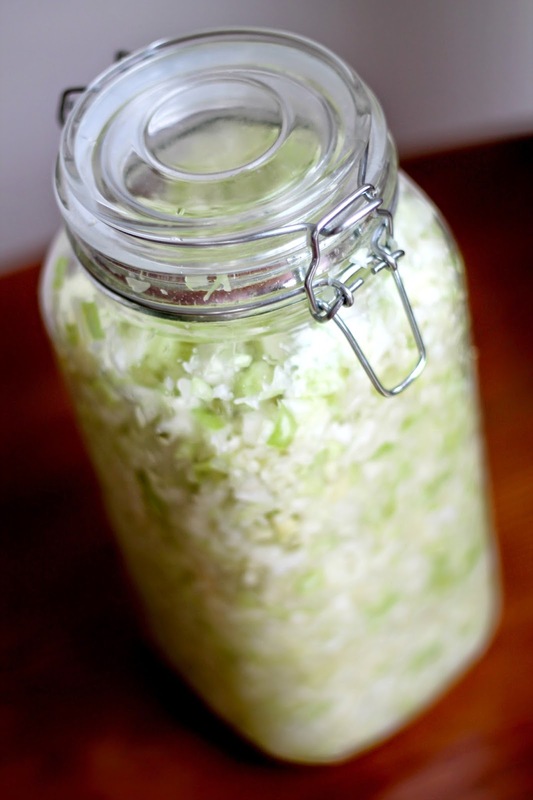 I’ve found sauerkraut easier to digest than cooked or raw cabbage, but start slowly. The GAPS book suggests starting with a teaspoon or so of the sauerkraut brine before eating the cabbage. 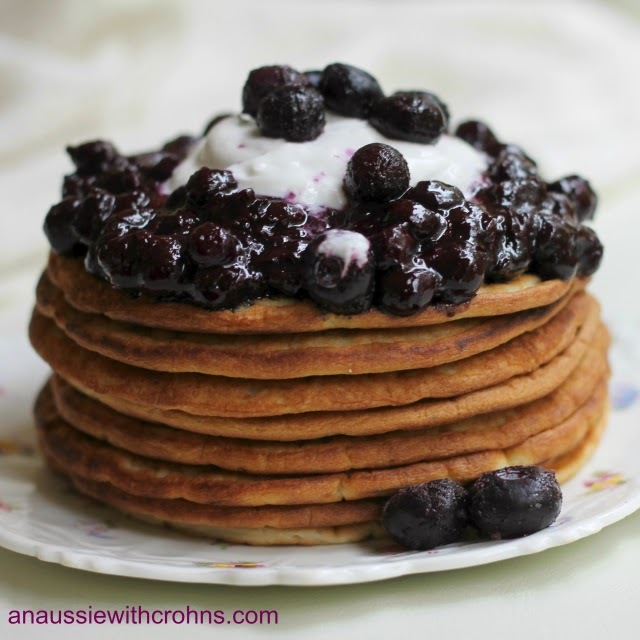 If you are having lots of digestive distress, this may be a good way to start. It’s so great to have another delicious food I can eat that is really good for me. Using a combination of green and red cabbage to make a pink kraut! Experimenting with adding spices; caraway seeds are traditional but I’ve also heard of fennel or coriander seeds, ginger and chilli. For me, they are such a special, weekend treat. Definitely not something I make very often! I've been experimenting with a pancake recipe for a LONG time now, but have finally got it right. 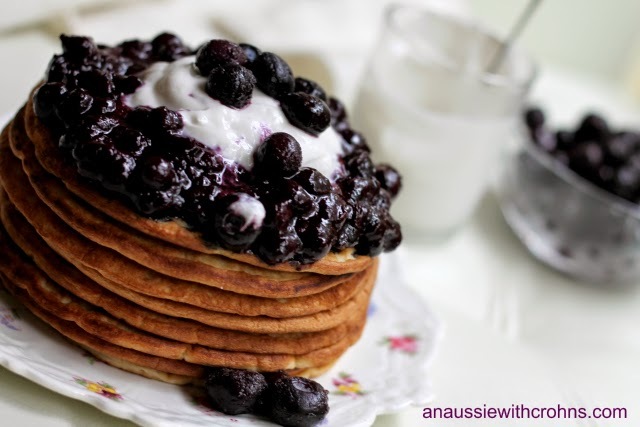 This recipe makes 4 pancakes, but multiply the recipe as you need to. 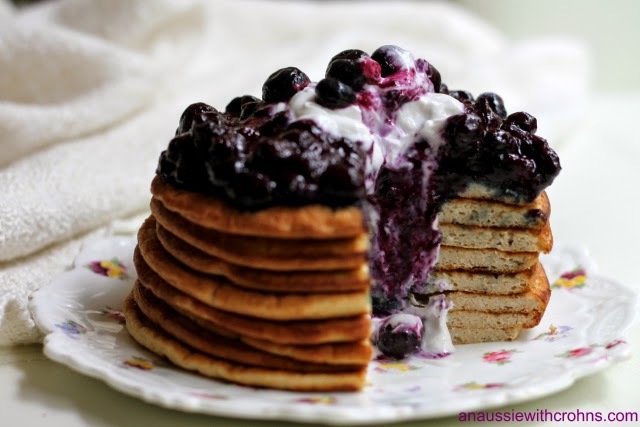 I've found these pancakes are best make thick. I usually use the back of the ladle to spread them out, but they are better if you don't. Anyway, enjoy experimenting with how you like them best. Add the coconut milk and whisk again. Ladle spoonfuls of mixture onto hot frypan, oiled with coconut oil if needed. Cook for a few minutes on each side, until golden brown. I've topped mine with homemade blueberry jam and coconut milk yogurt. Every day I say, "I LOVE food!" I've been having great fun teaching some Food Technology and Health lessons at school. It's inspired me to try so many new dishes. Tonight I'm trying the Spiced Rice that my Year 11s cooked this week, but mine will use cauliflower instead of rice. If you're on Instragram, you'll be able to see how it turns out! Do you prefer cookies or bliss balls? I just can't decide. I do know, though, that these Chocolate Bliss Balls are my favourite version so far. 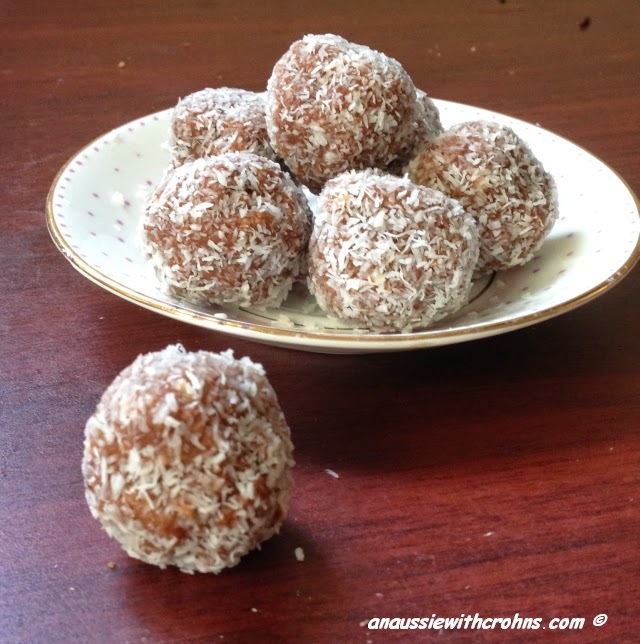 If you haven't already, check out my Original Bliss Balls, Banana Bliss Balls or Orange Bliss Balls. 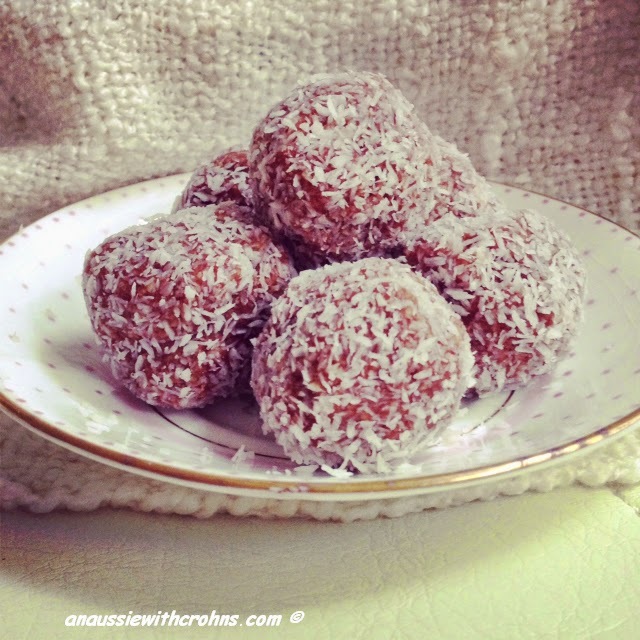 I love the way Bliss Balls are so quick and easy! 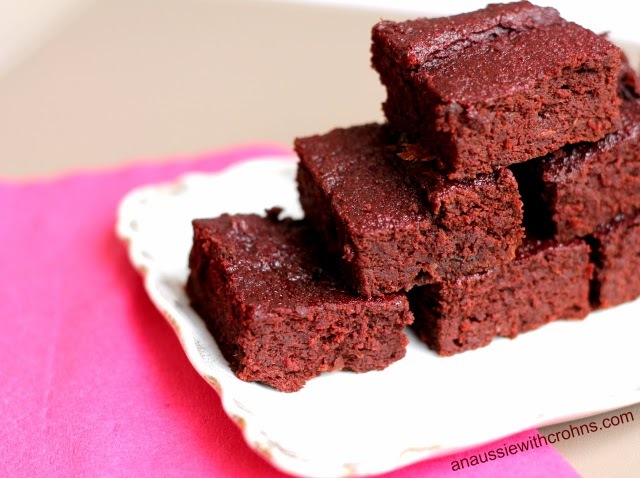 This version are rich, chocolatey and gooey in the middle. Enjoy! 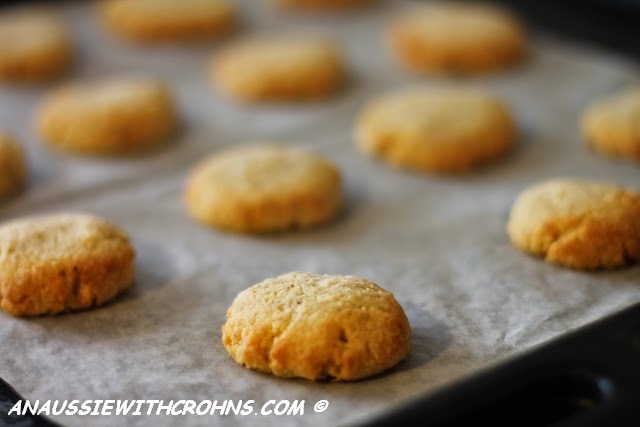 Toast cashews in frypan until golden brown. Blitz cashews in food processor until fine. Put dried dates into a microwave proof bowl. Cover with water and microwave for 2 minutes. Put in food processor with the cashews. Add the coconut butter, coconut oil and cacao powder. Process until mixture comes together. Add a bit more coconut butter if you need to. 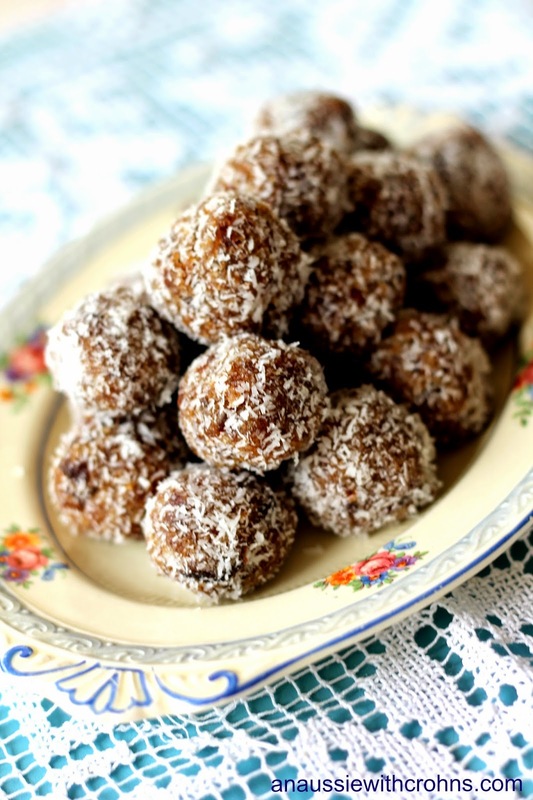 Roll teaspoons of mixture into balls and roll in desiccated coconut. Eat straight away or store in fridge to harden slightly. Life has been super busy! I seem to be spending more time doing food prep, but hopefully I'm getting a bit more organised. Since reading the GAPS book, I'm making bone broth and coconut yogurt a couple of times each week. I've also just started making kefir. (That's another story!) We're also eating a greater variety of veggies which has been awesome but does take time. Add in some organ meats... ahh! :) There really aren't enough hours in the day to cook all the recipes I'd like to try. 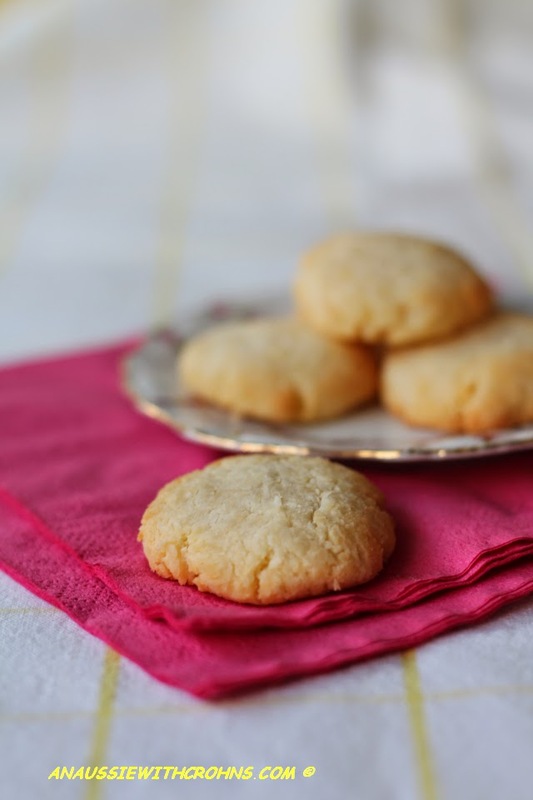 So I've been experimenting with very quick and easy treats to make. I've found Instagram is so much quicker than blogging! If you're after quick and easy recipes, IG is the place to be. I'm constantly inspired by the real food IG'ers that I follow. Lots of fun! 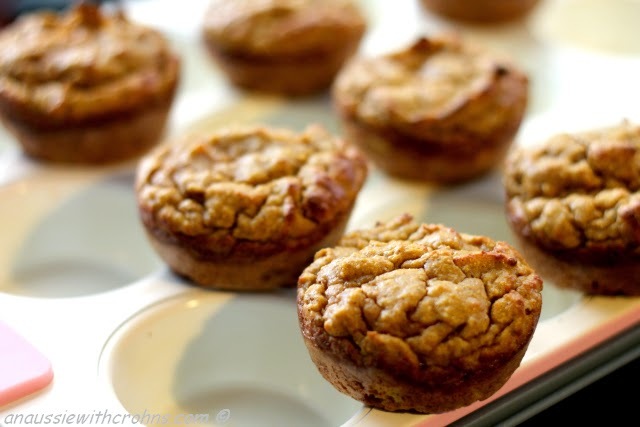 Melt coconut butter/paste in the microwave to soften. 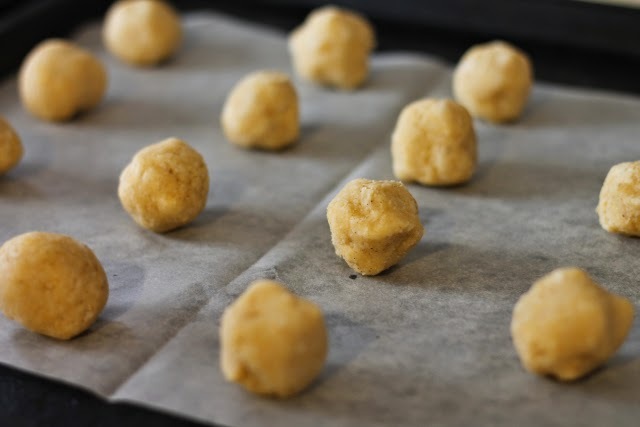 Roll heaped teaspoons of mixture into balls. Bake for 10 minutes until lightly browned. How quick and easy is that! Add in some vanilla or other spices for variety.